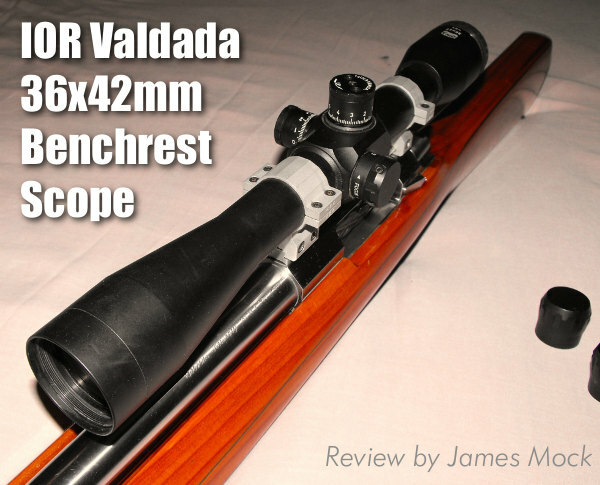 Note: In this review, James Mock talks about his experience with an IOR Valdada 36X fixed power scope. A newer, slightly-modified version of this optic is now available. 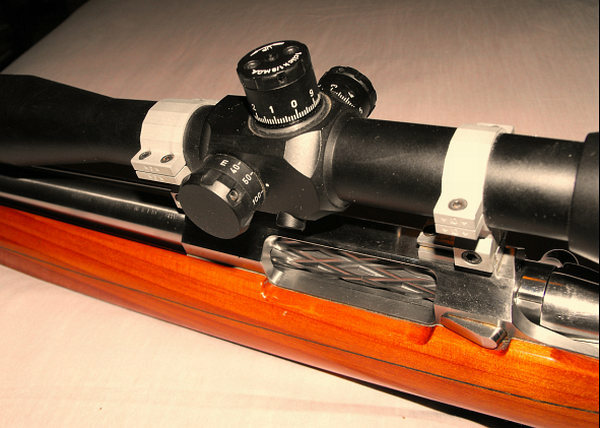 The current IOR Valdada 36x42mm scope is just like the scope James reviews, except that the rear ocular lens is slightly smaller and the new version is about three ounces (3 oz.) lighter. All of Mock’s observations and comments otherwise apply to the current production model. For the past eight years I have been using the IOR Valdada 36x42mm Benchrest scope on my 6mm Dasher/6PPC switch barrel rifle. It has performed flawlessly during this time. Perhaps this may be the best 600-yard fixed power scope in existence. 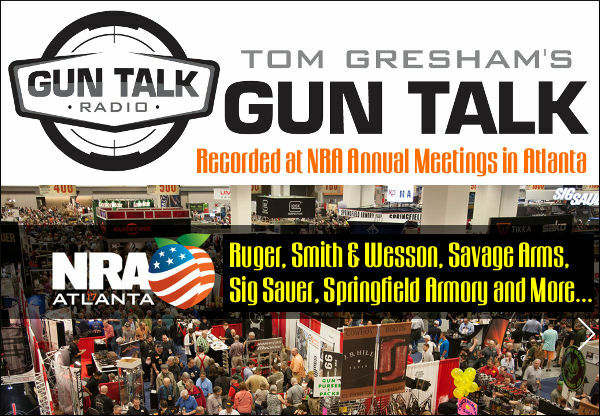 With the 1 MOA reticle one can judge the distance from sighter to point of aim very accurately. With this knowledge, he/she can either adjust the reticle to the point of aim or may use the hash marks for a definite aiming point. The 1/8th-MOA adjustments are positive and repeatable. There is a provision to set a “zero” after adjustments. The lens in this scope may be its outstanding feature. The glass comes from Schott Glass Werkes of Germany, and in my opinion it is as good as one can buy. Another great feature is the spring that is set against the erector tube (this is similar to the system used by the Nightforce BR model). The photo below shows the housing containing that spring. The IOR Valdada 36x42mm scope is offered with a fine cross-hair for those not wanting the MOA reticle. My choice is the MOA reticle with 1/8th-minute dot in the center. 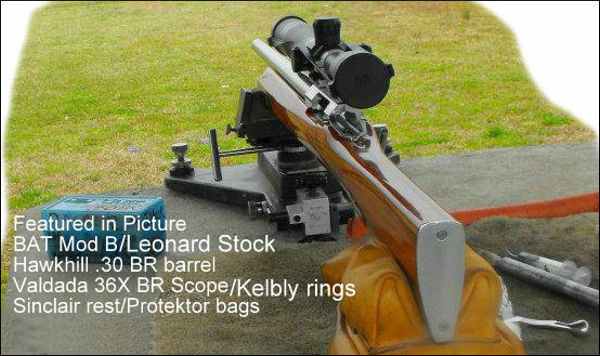 My first success using this scope was at the NBRSA Nationals at Desoto, Kansas in 2010. I won the 200-Yard Sporter Agg with a .1727. The scope performed flawlessly and I was lucky enough to pull the trigger at the right time. The following year I finished second behind Jeff Thompson III in the Sporter 200 at the NBRSA Nationals at Midland, Texas. Hall of Fame shooter Don Powell commented that my shooting had really improved since I switched to the Valdada. This scope is rock solid and it surely didn’t hurt my shooting. I have not shot much short range Benchrest in the last few years, but I still use the Valdada in 300- and 600-Yard matches quite often. Its adjustments are crisp and accurate. The adjustments move the reticle 0.125 inches at 100 yards and therefore 0.75 inches at 600. Using the MOA reticle and the precise adjustments, one can determine the number of clicks needed by using the reticle to see how far off of the aiming point one is on the sighting gongs. If a person wants to “hold off” rather than adjust the scope, he/she can do so by using the hash marks for a definite aiming point. Since I got my IOR Valdada 36x42mm scope, there have been some changes made. My scope weighs about 25 ounces but the new one is about 3 ounces lighter. The folks at IOR (Valdada) got input from Bart Sauter and made the ocular (eyepiece) lens smaller and the scope lighter. Bart is now a distributor for Valdada and many in the Benchrest community are now using this fine scope. Billy Stevens won the Super Shoot and qualified for the World Team using the Valdada. If you are interested, please contact Val Leautu in Littleton, CO at 303-979-4578 or Bart Sauter at 270-879-4279. Share the post "Optics Review: IOR Valdada 36x42mm Benchrest Scope"